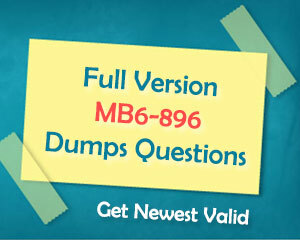 Passing MB6-896 exam with online exam questions would be a most effective way now. Here we have Microsoft Dynamics 365 for Finance and Operations MB6-896 Exam Questions which are more than enough to pass Microsoft Distribution and Trade in Microsoft Dynamics 365 for Finance and Operations MB6-896 exam at a first trial. 1. You negotiate product-specific pricing with a customer for two products. You need to create a sales price trade agreement for the customer that includes the two products. Which three actions should you perform? Each answer represents part of the solution. A. Validate and post the journal. B. Enter the journal lines for each product. C. Create a trade agreement journal. E. Select an account code of Group. 2. You need to enable the purchase order (PO) process to initiate for a vendor when the vendor accepts a PO. 3. You need to create vendor accounts by using Microsoft Dynamics 365 for Finance and Operations. 4. You need to configure a customer record to enable shipment of orders to the customer by rail. A. Set up a delivery charges group. B. Create terms of delivery. C. Create a mode of delivery. D. Create a destination code. 5. You are creating a customer record. You need to add transportation costs to customer orders. 6. Which two types of trade agreements are supported in Microsoft Dynamics 365 for Finance and Operations? Each correct answer presents a complete solution. 7. You are the accounts receivable manager at Contoso. Ltd.
You must configure commission calculations based on information provided from the sales team and upper management. You need to configure the groups for commission calculations. Which three types of groups should you configure? Each correct answer presents a complete solution. 8. Which steps are needed to set up the transport calendar in Microsoft Dynamics 365 for Finance and Operations? 9. Which status is required before you can generate a picking list for a sales order? 10. Which of the following factors should be considered for delivery data control functionality? 11. Which two actions can be performed on the sales quotation? Each correct answer presents a complete solution. 12. You need to define charges specific to a customer or vendor that will be automatically added when new sales or purchase orders (POs) are created. Which three types of charge groups can you define as auto charges? Each correct answer presents a complete solution. 13. Which action on a sales order indicates that physical inventory has been deducted? C. Post a packing slip for a sales order. 14. You need to flag an item for direct delivery. A. Select a Direct delivery warehouse for the product. B. Enable the Direct delivery slider on the products. C. Select a default vendor for the product. D. Select a Direct delivery site for the product. 15. You are creating a sales agreement. The sales agreement must affect the unit price, price unit, and discount amount for a sales order after the sales order is linked to a sales agreement. 16. You have two warehouses that are positioned next to each other on the same city block. Transfer orders are generated automatically according to a master plan for moving inventory between warehouses. You need ensure that the system supports the movement of inventory from one warehouse to the other. 17. A customer places weekly orders. The items and quantities purchased each week rarely vary. You need to make order entry for the customer as quick and easy as possible. 18. A company has two sales groups. A member of the Eastern sales group creates a new sales order for a customer. The sales order line is calculating the commission for the Central sales group instead of the Eastern sales group. You need to generate the commission for the Eastern sales group. 19. You need to group various delivery modes together in order to calculate and apply automatic charges to sales orders. 20. Each time you sell a specific product, an installation charge must be added to the sales order. You need to configure Microsoft Dynamics 365 for Finance and Operations to automatically add the installation charge to sales orders. A. Set up an auto charge. B. Set up a customer charge group. C. Set up an item charge group. D. Set up a supplementary item. E. Set up a charges code. 21. You plan to submit a quotation to a prospect to sell them equipment. The selling prices that you list on the quotation must generate a contribution ratio of at least 30 percent. You need to create the sales quotation. Which sales quotation option should you use? 22. You are configuring a new legal entity. You need to map the main accounts for inventory posting. 23. You create 10 new product masters and release them to a legal entity. You need to validate that the product setup is complete. Which three fields does the Validate function check to ensure that a value is populated? Each correct answer presents part of the solution. 24. You add a new a new product to the system. You plan to add attributes for the product. You need to ensure that a user can select from an alphabetical list of specifications. 25. You add a new product to the system. You need to assign attributes to the product. Where should you assign the attributes? 26. You are implementing Microsoft Dynamics 365 for Finance and Operations for a new customer. You need to use a weighted average for all items as the costing methodology. Which type of group should you configure? How to pass MCSE: Core Infrastructure 70-414 exam easily?